We use lots of different names to describe that special place where we are at peace and in balance, and where all is right with the world . . . Heaven, Nirvana, Paradise, the Promised Land. What does such a place look like for nonprofit communicators? I think it's a place where creating and curating both content and conversation come together. 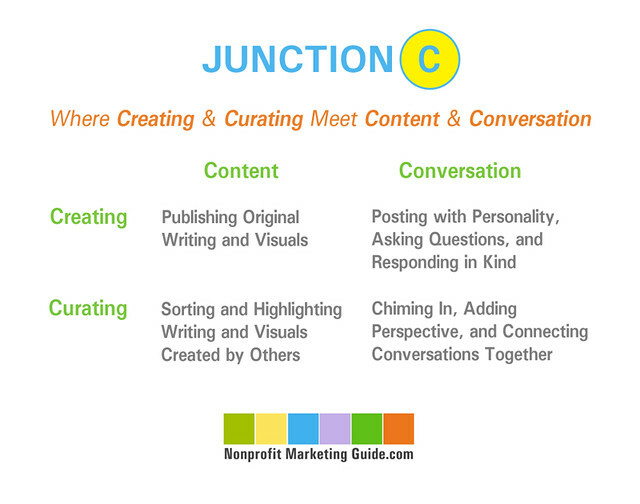 I'm calling it Junction C.
Creating Content: You are publishing original content produced by staff, volunteers, and/or consultants for your organization, including writing and visuals like infographics, photos, and video. This helps us, your supporters, understand your expertise and your value as an organization working on issues we care about. Curating Content: You are also serving as an editor, sorter, and digester for us, your supporters, by finding, analyzing, and highlighting content created by others that you know we will appreciate. We trust you to share that good stuff with us, because we don't have the time to find it all ourselves. Creating Conversation: You are starting conversations with current and potential supporters by showing us that you are a real person who is passionate about the cause, just like we are. You do that by posting with personality on Facebook and Twitter, on your blog, etc. You care what we think, so you ask questions, and you respond in kind to those who reply to your conversation starters. Curating Conversation: You participate in conversations started by others by chiming in with helpful additions or adding a different perspective. You connect different conversations on similar topics together, pointing supporters to other places where we can talk about the issues we care about (this can be as simple as retweeting or sharing a link on Facebook). When you do all four of these things, you position your organization as a leader, while still being "one of us." You talk and you listen. You share what we, your supporters, want to receive, whether you or someone else created it. You build a community of supporters who want to be around you, because you make it easier for us to learn about the issues and to show how much we care about them. Check out what several nonprofit communicators say about creating and curating content and conversation in these series of interviews.